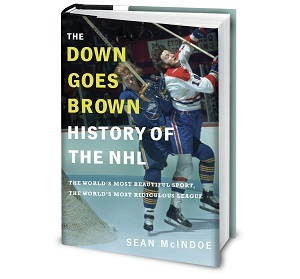 Down Goes Brown: Larry Tanenbaum really has no idea, does he? Leafs co-owner Larry Tanenbaum was asked an interesting hypothetical question today: would you take a guaranteed Stanley Cup win right now if you knew it meant five years of losing immediately after? As a practical matter it's a meaningless question, of course, since there's absolutely no way to ever guaranatee any result, least of all a Stanley Cup. But it's still an interesting thought experiment. And of course, Tanenbaum proceeded to give an answer that was absolutely and inarguably wrong. "If you asked us if you were to pay for a Stanley Cup team this year, but you were to be lousy for the next five years, would you do it? The answer from the ownership point of view, absolutely not. " The Stanley Cup is the goal. From a big picture standpoint, it's the only goal. Period. Not consistency. Not winning seasons. Not playoff wins. Not even, despite what the anti-Leafs media types have apparently decided in recent years, Finals appearances. It's about the Cup. The rest is just noise. "It would be an interesting survey. If someone would say we could win a Stanley Cup one year and go from first to worst and stay worst for a long period of time, would they actually take that?" Yes, of course we would, and if you actually need that explained to you then you're even worse at this than we thought you were. Let's look at it this way: The Leafs were very good, a realistic Stanley Cup contender, every season from 1998-2004. That's six years, including seven playoff rounds won and two trips to the conference finals, but no Cup. If you had the chance to trade all that success for one Stanley Cup and fives years of misery, would you take it? Imagine the Leafs were really bad during that stretch, except for one year when it all came together and they won the Cup. We had a parade. They all got rings. There's a big banner that hangs form the rafters at the ACC every night. Is anyone even having to think about this? Ask a Senator fan if they'd trade all their President's Trophies and regular season success for one single Cup. Ask a Ranger fan if they'd like to trade that 1994 Cup (followed shortly after by almost a decade of missing the playoffs) for some consistent success. Do these ownership types have any idea what it means to be a fan? A single clue? At all? Again, none of this means that teams should blow their brains out to load up for a playoff run every year. That's usually a bad a strategy, and the Leafs are absolutely right to be focusing on a long rebuild right now. But they're right to rebuild because that's the best way to win a Cup. Not the best way to be consistent or have long-term success. To win a Cup. If Leaf ownership really can't understand that, even hypothetically, then we may be in even worse shape than we thought. i think PPP made a good point that this was a lose-lose question for Tanenbaum...but, still, cup now. Winning seasons and a cup thrown in here and there. Did I read that correctly? The reporter said a Guaranteed cup win? Its an easy shot at Larry but I feel better with his answer, becasue you can't buy a cup. Maybe you could pre cap but no longer. Its the right answer to build a long term contender, because then you may only be a player away from a cup every year. I think you should take a breath on this one. His answer should have been, I dont answer hypotheticals, however the best way to win a cup is to build a proper year in year out competitor like Detroit, and thats what we are doing. It was a hypothetical, and the right answer was a cup as far as I am concerned. We have had years of crap and years in the conference finals and through it all a cup is the only goal.